This part of the TTP X-Files is about tuning the Triumph Scrambler with bolt-on modifications. It outlines our experiences using different induction and exhaust configurations which are outlined below. 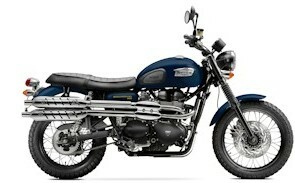 The Scrambler has the 270° twin engine which is also used by the America and the Speedmaster, but it has the airbox used by the Bonneville/T100 and Thruxton which is of a different design to the America/Speedmaster airbox. This combination along with unique inlet cams and exhaust header pipes gives very different results when compared to tuning the America/Speedmaster 270° engine. The initial dyno run was carried out on a factory standard 2009 EFI Scrambler with around 4000 miles on the clock and the SAI system was removed. The induction modifications used were the TTP Stage 1 Torque Induction Kit with and without the internal airbox baffle (Stage 1.5) and the TTP Stage 2 Power Induction Kit. The exhaust silencers/system used were the Triumph Off Road Silencers (TORS) on standard headers, free flowing silencers on standard headers and a complete 2-1 exhaust system. All of the dyno graphs shown have the 'OEM' run as a comparison. There are three common variations of airbox modification for the Scrambler. Deciding on which airbox mods are right for you is very much dependant on how much power you want, where you want the power to be produced and how much time and money you're willing to invest in your bike. Stage 1 Torque Induction Kit - Basic Airbox Mods. Stage 1.5 - (Stage 1 Torque Induction Kit plus internal airbox baffle removal, click here for guide). Stage 2 Power Induction Kit - Airbox Replacement & Pod Filters. The dyno's below compare the induction systems with a specific exhaust system. 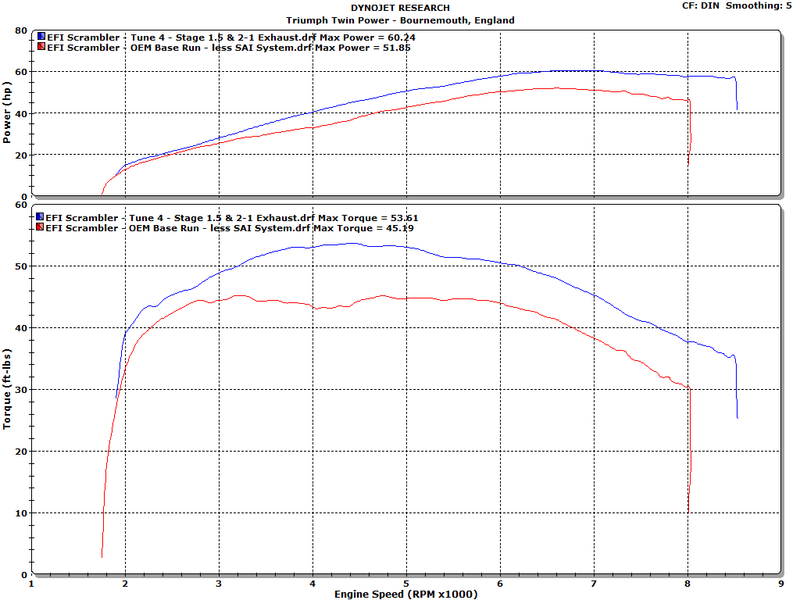 This enables you to see what effect changing the induction has on your chosen exhaust. TORS with Stage 1 - Better torque than with Stage 2 upto 4,400rpm, but doesn't release as much top end power as Stage 1.5 or Stage 2. TORS with Stage 1.5 - Best for low-mid range torque with less BHP above 5,100rpm compared to Stage 2. 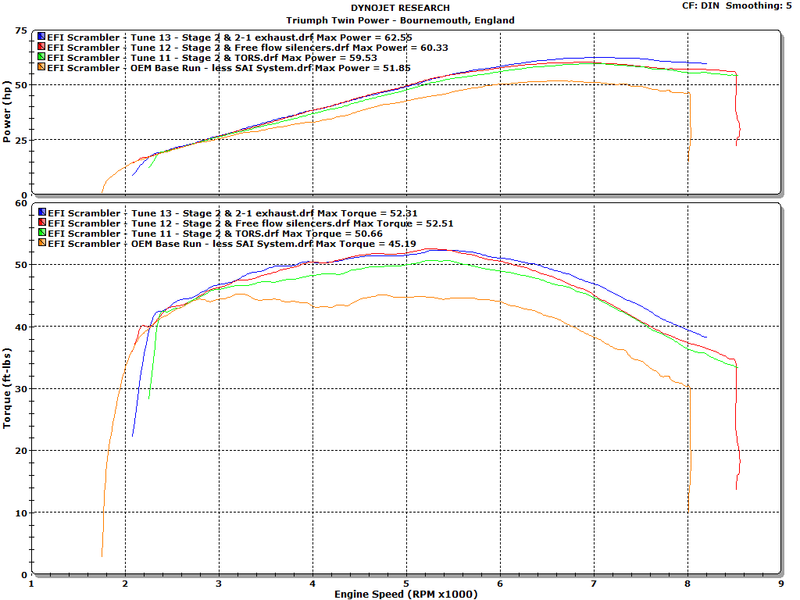 TORS with Stage 2 - Best overall top end power, but a loss of torque below 5,100rpm compared to Stage 1.5 and below 4,400rpm compared to Stage 1. Free flowing silencers with Stage 1.5 - Excellent low-mid range torque with a reduction of BHP above 5,100rpm compared to the Stage 2 Kit. Free flowing silencers with Stage 2 Power Induction Kit - Best overall top end power, but a loss of torque below 5,100rpm compared to Stage 1.5. 2-1 system with Stage 1 Torque Induction Kit - Easy to install, better torque than Stage 2 upto 4,400rpm, but doesn't release as much power as Stage 1.5 or Stage 2. 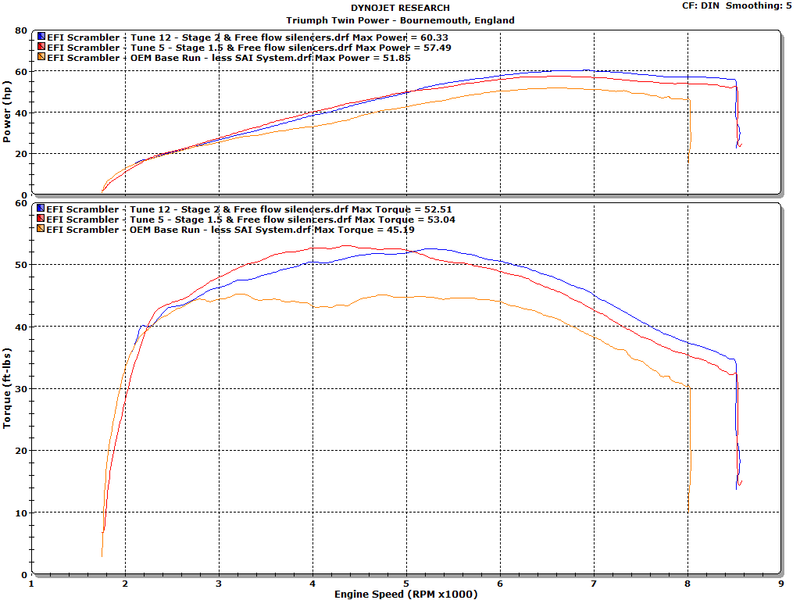 2-1 system with Stage 1.5 - Best for low-mid range torque with a reduction of BHP above 5,200rpm compared to Stage 2. 2-1 system with Stage 2 Power Induction Kit - Best overall top end power, but a loss of torque below 5,200rpm compared to the Stage 1.5 and below 4,400rpm compared to Stage 1. For our exhausts selection we chose TORS, free flowing 2-2 silencers and a complete 2-1 system as these are representative of the most used exhausts by owners on the Scrambler. With silencers, if the exhaust note is louder, then generally they give better power at the top end and sometimes in the mid-range unless little thought has gone in to the silencer design. With the Scrambler, no matter which 2-2 silencers you use, a full 2-1 system will generally give better performance all the way through the rev range. The dyno's below compare each of the three exhaust systems with the induction systems. This enables you to see what effect an exhaust has on a particular induction system. 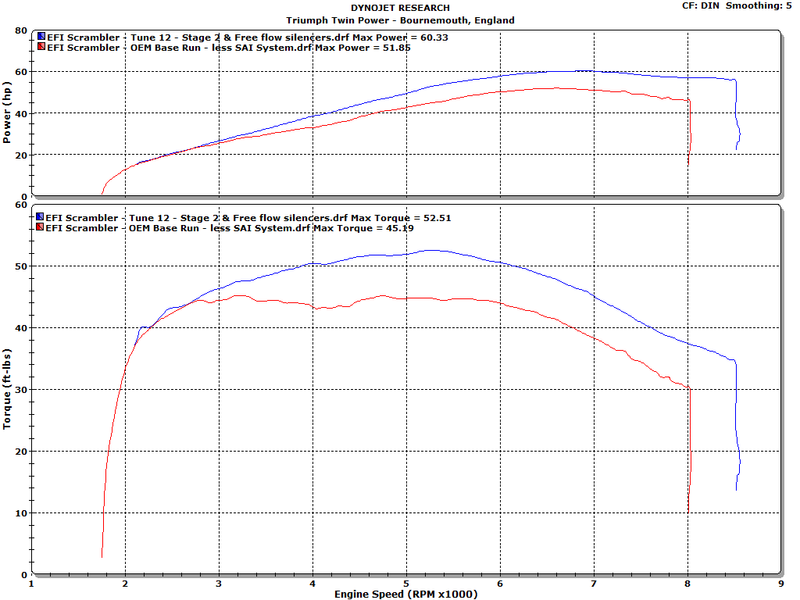 Stage 1 Torque Induction Kit with a 2-1 system - Best overall power and torque. 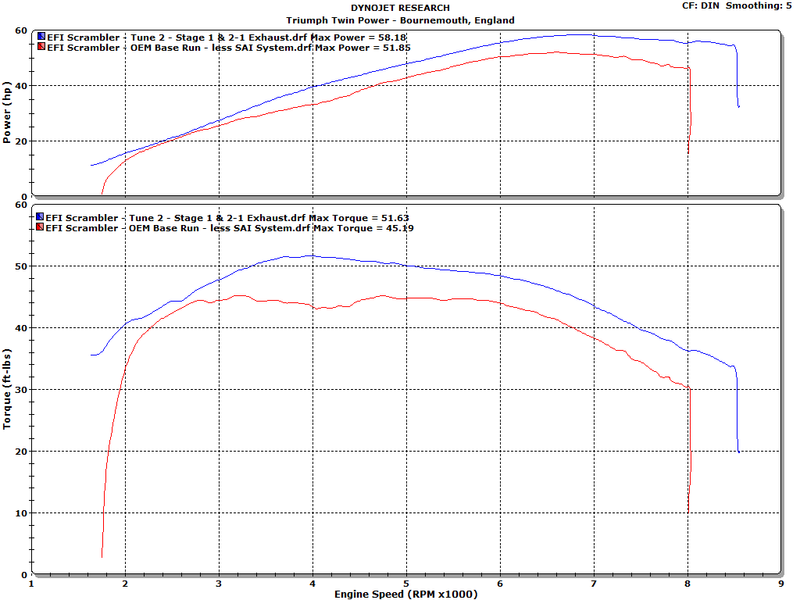 Stage 1 Torque Induction Kit with TORS - Can't match a 2-1 system, but far better torque and power than a standard bike. Stage 1.5 with a 2-1 system - Best overall power and torque throughout the rev range. Stage 1.5 with free flowing silencers - Very close figures to the 2-1 system up to 5,500rpm, then the 2-1 system pulls away. Stage 1.5 with TORS - Loses out to the other exhausts in most of the rev range, but very close figures above 6,500rpm to the free flowing silencers. Stage 2 Power Induction Kit with a 2-1 system - Best overall top end power, but only pulls away from the free flowing silencers above 6,000rpm. Stage 2 Power Induction Kit with free flowing silencers - Very close figures to the 2-1 system up to 5,500rpm, then the 2-1 pulls away. Stage 2 Power Induction Kit with TORS - Loses out to the other exhausts from around 3,000rpm to 6,700rpm, but very close figures above this compared to the free flowing silencers. Many owners who embark on modifying their Scramblers will eventually need to come to a decision about what they are going to do about the induction system. Do they go for airbox mods or airbox removal with an airbox removal kit and pod filters. As the previous dyno's have many traces and can be confusing while trying to analyze them, the below dyno comparisons for Stage 1.5 and Stage 2 Power Induction Kit will help in this respect, by giving a clear comparison of the power and torque you can expect and where it will be delivered from either induction mods with the respective exhaust systems. Stage 1.5 - Good low-mid range torque with good top end power. 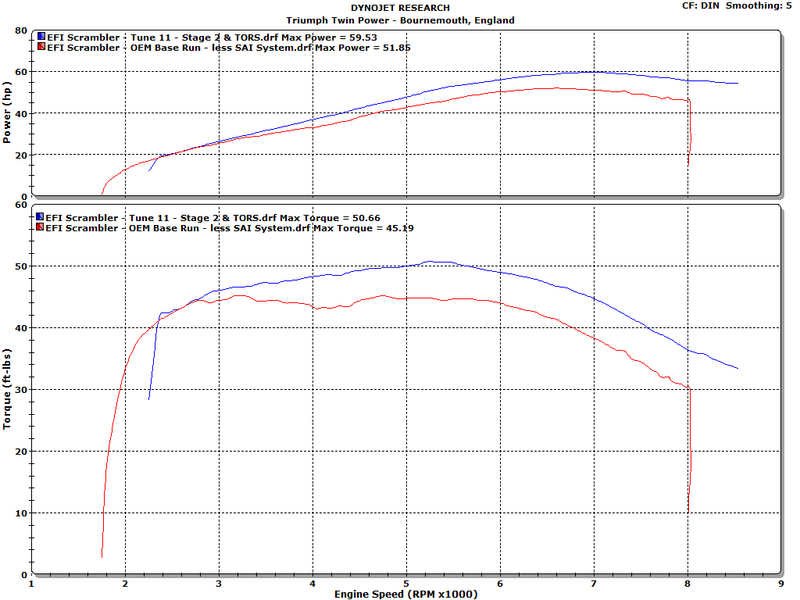 Top end power loss above 5,100rpm compared to Stage 2. Stage 2 Power Induction Kit - Good top end power, with a noticable reduction of torque available below 5,100rpm compared to Stage 1.5. Stage 1.5 - Excellent low-mid range torque with good top end power. Top end power loss above 5,100rpm compared to Stage 2. Stage 2 Power Induction Kit - Very good top end power, with a noticable reduction of torque available below 5,100rpm compared to Stage 1.5. Stage 1.5 - Excellent low-mid range torque with very good top end power, only noticable reduction of top end power above 6,500rpm compared to Stage 2. Stage 2 Power Induction Kit - Excellent top end power, with a noticable reduction of torque available below 5,250rpm compared to Stage 1.5. Please click the tune number to see the relevant dyno graph. The Best Combo - Determined by the dyno graphs, road testing and my ears! The Scrambler isn't about all out power, it's about making excellent torque. After all, who wants to ride a Scrambler at over a ton for more than a couple of minutes, if at all. After studying the dyno graphs extensively there is one mix of induction and exhaust where there's a significant upside and no significant downside and this is the Stage 1.5 (Stage 1 Torque Induction Kit with internal airbox baffle removed) and a 2-1 exhaust system. This combination gives excellent low to mid-range torque that you’ll experience every time you ride your Scrambler, with the benefit of respectable top end power when it’s required. It only loses out on top end power above 6,500rpm by a couple of BHP compared to installing a Stage 2 Kit, but gives the best low to mid range torque of any combination. Other than the excellent torque and decent top end a 2-1 system gives, there is another reason to like a 2-1 on your Scrambler, the exhaust note. The sound of a 2-1 system on the Scrambler’s 270° engine is excellent, it sounds like a big single thumping down the road and you won't hear anything like it with a 2-2 system installed. I accept this is just my personal opinion after testing each type of exhaust and I accept any exhaust note is subjective to each individual, so your ears may differ! I hope this article will help you to be informed about the bolt on torque/power mods available and may help to make your Scrambler right for your style of riding. Keep the rubber side down and ride safely. We have a guide on how to remove the internal airbox baffle HERE and our testing on air filters HERE determined which filters to use.